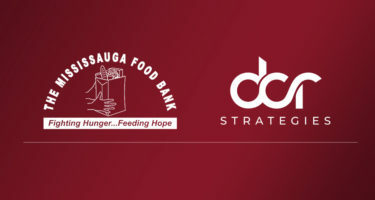 Community Outreach | DCR Strategies Inc. Community Outreach | DCR Strategies Inc.
At DCR we’re not just about rewards; we also want to help make the world a better place. With unique loyalty options we enable our programs to help support charities, causes and outreach programs. 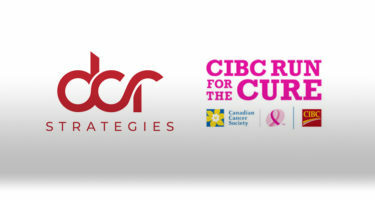 DCR Strategies participated in Canadian Cancer Society’s CIBC Run for the Cure to make breast cancer beatable. We ran in honour of all of the incredible women in our lives and raised over $1,000. Thank you to everyone who helped contribute! 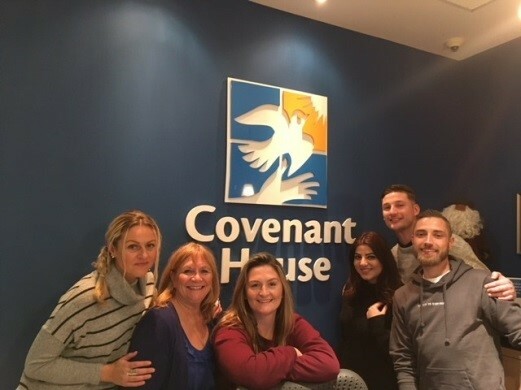 Covenant House Toronto, Canada’s largest shelter for at-risk, homeless, and trafficked youth, has provided opportunity and hope to more than 90,000 young people since it opened its doors in 1982. Over the holiday season, six members of DCR Strategies spent a day working alongside staff at Covenant House. Following a guided tour of the living quarters, communal area, active areas (which includes a full gym), and donation rooms, the team helped serve lunch to the youths and meet with on-site staff. It was an emotional, eye-opening experience that left everyone in attendance with an unforgettable memory. 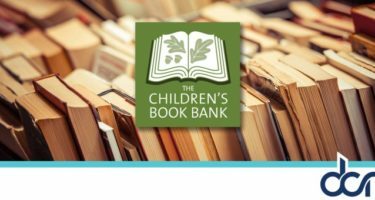 The Children’s Book Bank is a charitable organization whose mission is to provide children’s books and literacy support to children living in high needs communities in Toronto. The Book Bank is just like a wonderful children’s bookstore, except that the books are available to the children FREE of charge. The Children’s Book Bank offers informal literacy support through its various programs, including “Dictionaries for Newcomers,” and “Books across the City.” They also host “School Trips with Story Times,” where local schools visit the Book Bank for story time followed by free “book shopping.” Each child and visitor is allowed to select one book from the storefront to take home and keep forever. 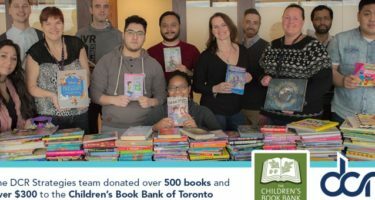 The Children’s Book Bank relies on communities in Toronto to help it build and sustain its inventory of books. DCR Strategies has agreed to support The Children’s Book Bank by hosting a book drive at DCR. The donated books need to be gently used, suitable for children up to grade six (11yrs/12yrs), and printed within the last 10 years. Staff members at DCR Strategies teamed up to send over 500+ books to children in need across the Toronto area. “Operation Christmas Child,” a project of Samaritan’s Purse, brings good news and great joy to children around the world by gifting shoeboxes filled with fun toys, hygiene items, and school supplies. Samaritan’s Purse is a humanitarian aid organization that provides aid to people in physical need as a key part of Christian missionary work. Each year, people of all ages pack shoebox gifts to help children in need around the world. Parents often use the project to teach their kids about giving. Churches and groups of all sizes collect boxes from their communities, and thousands of volunteers serve annually to help inspect, prepare, and ship shoeboxes to over 100 countries. Only a $10 donation is required to cover project costs–including shipping–for each shoebox. Staff members at DCR Strategies teamed up to send more than 50 boxes of toys to children in need across the world. We’re always looking for new opportunities to make a positive impact in our community.